The Bharatiya Janata Party (BJP) announced a list of 182 candidates for Lok Sabha polls. Prime Minister Narendra Modi will contest from Varanasi and Amit Shah will fight from Gandhinagar. General VK Singh will contest the Ghaziabad seat. Smriti Irani will contest from Congress bastion Amethi, while Nitin Gadkari will fight for the Nagpur seat. Amit Shah will contest from Gandhinagar constituency, which LK Advani retained for from 1998 to 2019. Union minister Kiren Rijiju will fight from Arunachal East and Mahesh Shamra Gautam Buddha Nagar (Noida). 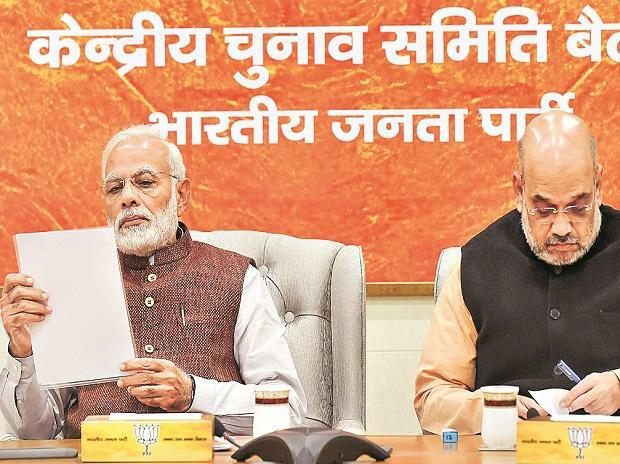 The BJP announced its candidates from many states, including Uttar Prdesh, Uttarakhand, Tamil Nadu, Gujarat, Chhattisgarh, West Bengal, Rajasthan, Arunachal Pradesh and Tripura. The BJP has finalised names of all 17 party candidates from Bihar and sent the list to the state unit which will announce it jointly with allies, Nadda said. In Guwahati Lok Sabha constituency, BJP fields new candidate Queen Ojha to replace veteran leader Bijoya Chakravarty. Kerala BJP chief Kummanam Rajasekharan to fight Shashi Tharoor in the Thiruvananthapuram Lok Sabha constituency. Sujay Vikhe, son of former Maharashtra leader of oppn Radhakrishna Vikhe Patil, to contest from Ahmednagar. Both father and son crossed over to BJP recently. Voting to elect the 17th Lok Sabha (LS) is scheduled to be held over seven phases from April 11 to May 19 and the counting of votes will take place on May 23.